This timeless bag is back and better than ever - definitely not your old-man's brief case, that's for sure! Tricked-out with a padded laptop sleeves that fit most laptops, durable seat-belt material used for our shoulder strap that glides over your clothes effortlessly, piggy-back panel on the backside to slide over your trolley handle that is guaranteed to stay securely in place while you're jet-setting in style. The Siamod San Francesco 15.6" Leather Messenger Bag Cognac, it has a contemporary, clean, flap-over design with magnetic snaps. The Siamod San Francesco 15.6" Leather Messenger Bag Black, it has a contemporary, clean, flap-over design with magnetic snaps. The Siamod Sabotino 15.6" Leather Vertical Messenger Bag Cognac, is a perfect bag for the urban warrior. Its top zip closure secures everything inside and allows for even weight distribution for better balance. 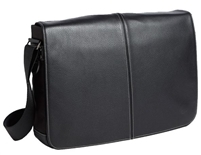 This black sophisticated leather messenger bag offers style and function in a smaller package. There is room for files and folders along with an organizer to hold your mobile phone, portable hard drive, pens, and your accessories. It has a clean, classic design with solid brass turn lock closure. This slim flapover briefcase is made from hand-stained vegetable re-tanned buffalo leather. This sophisticated leather messenger bag offers vintage style and smart organization. Hand made from buffalo leather. The Boconi Becker Buckle Messenger Brief in Whiskey Brown has gingham accented linings and authentic brass hardware. The Boconi Becker Flap Dispatch Briefcase in Whiskey Brown has gingham accented linings and authentic brass hardware. Looking for a special messenger bag? Please don't hesitate to contact us with any questions.